Every week, a lucky Bryant Park Corporation employee gets to explore The Holiday Shops at Bryant Park to give you a glimpse at what this yearâ€™s vendors have to offer. Check out the gift options for dads that Ethan found throughout the park in just one hour of shopping. Amidst the holiday music, parties, tree lightings, concerts, special events, and end of year work, it's time to brave the crowds and search for something unusual, useful and special for my Dad. My Dad might be one of the most difficult people on my list to please. I usually get him books, but I'm determined to find something different this year. My ground rules are: 1) shopping cannot take very long, 2) the gift must be something that I like, 3) it must be something he will want to use, and 4) it must be able to be mailed easily. So I'm taking an hour at lunchtime to find and buy a perfect gift. Although my Dad has never worn ties regularly, he needs at least one for special occasions. Andy Fera is a NYC designer that creates ties and cufflinks. 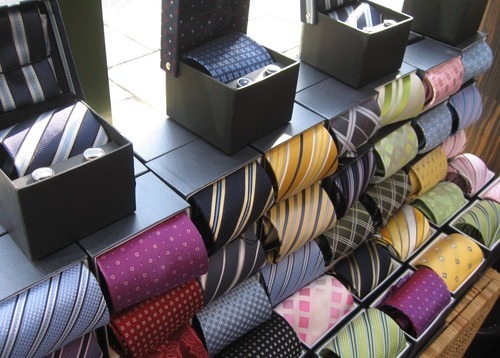 He has silk ties in a variety of colors for $30 each, and microfiber ties (washable and ironable) that are 2 for $30. 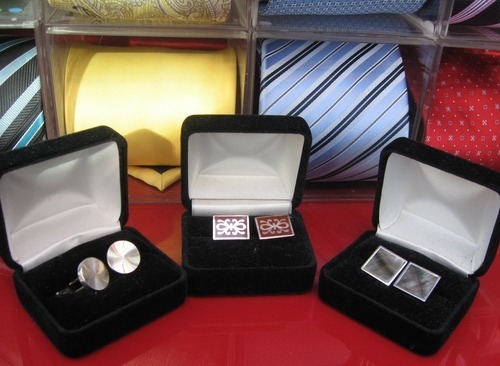 Andy's cufflinks ($50) are sterling silver and available in mother of pearl, enamel, coral, and geometric designs. As a holiday bonus, Andy gives a tie free of charge to anyone who signs up for his mailing list. In my Dad's office, there is empty wall space everywhere you see, so he needs something there. John Conn's photographs at The Conn Artist capture moments from 1980’s New York City, as well as from his adventures throughout the world. 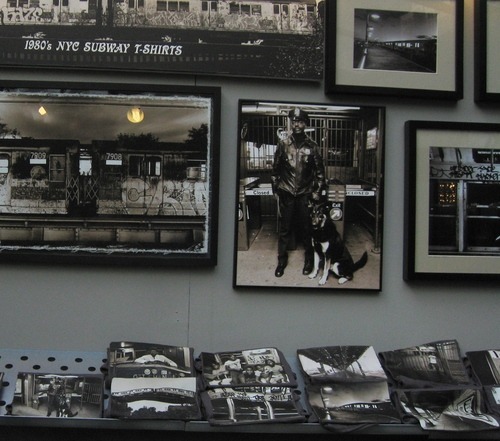 He uses a heat transfer process to put his photos on T-shirts ($25 each or two for $40), and his prints come unframed or framed ($45 to $125) and as cards ($4). 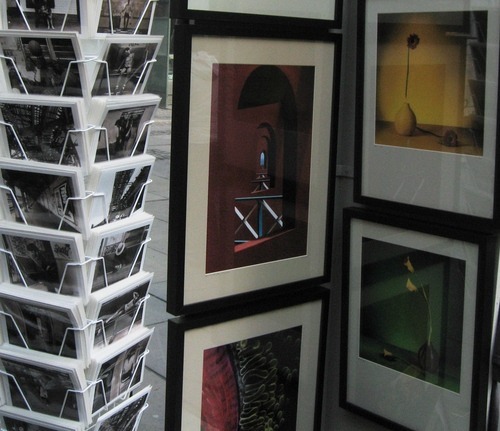 Photo albums of his wonderful pics (handmade in Argentina by a friend) are sold for $100, and photos printed on canvas, locked between two layers of glass, and framed are $375. Next month, John is off to Antarctica for a new adventure and more photographs that we may see next year at The Shops. 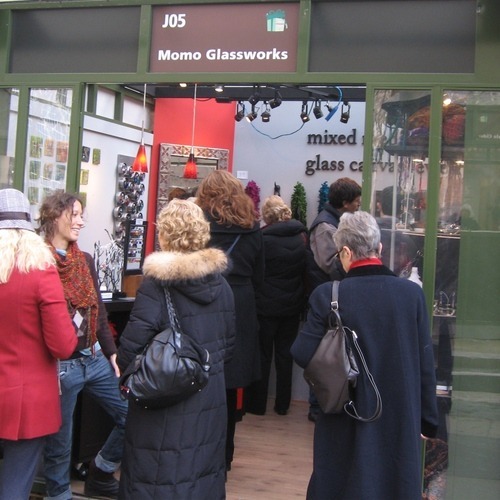 From Northampton, MA, (originally from Argentina) come the artists at Momo Glassworks, a popular kiosk on the Upper Terrace, full of art in the form of colorful and sparkly rings, pendants, pins, artwork, and more. For times when my Dad really wants (or has) to dress up, Momo's multilayered colored glass links are beautiful and they cost only $36. 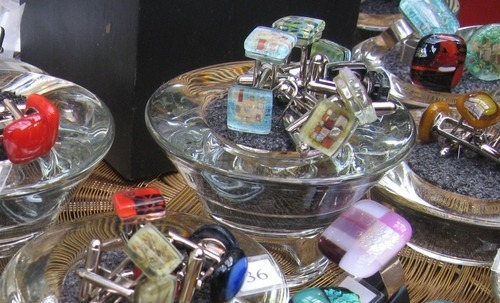 Plus, they create fused glass links with enamel and metal inclusions that really sparkle ($44), as well as wonderful art pieces that are meant to hang on a wall ($90 to $120). For any man who has dreamed of being a Samurai, this is the next best thing and perfect for everyday use. Knife designer Corey Milligan of New West KnifeWorks partners with bladesmiths from Seki, Japan (the center of Samurai sword making for the last 800 years) to create gorgeous, handmade knives. The blades are made from the finest high carbon stainless steel, optimized to hold an edge and to be sharpened easily. 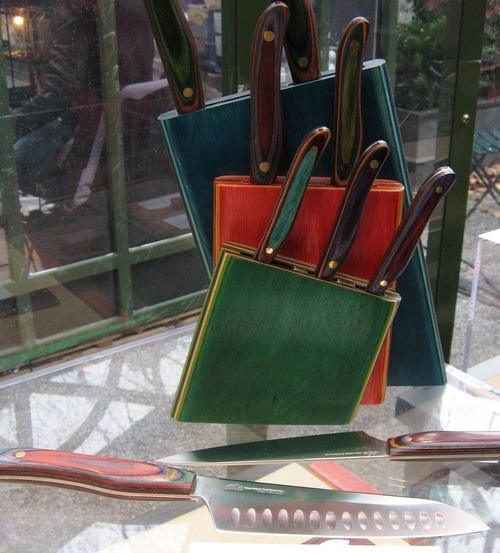 Corey fashions multi-colored fusionwood handles that will stay beautiful for years with little maintenance, as well as fusionwood knife displays for the wall or kitchen counter. The Phoenix Line features nearly indestructible Corian-like material or tropical Cocobolo wood for the handles, and 16-layer Damascus forged high carbon steel blades. 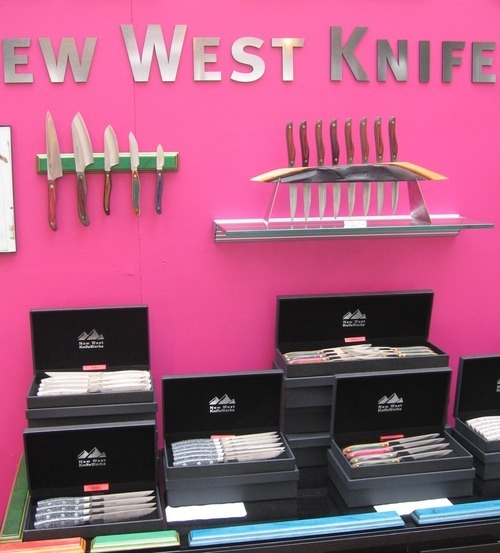 Knives are $45 to $179, accessories are $25 to $59 (diamond sharpener is $39), and sets go from $150 to $995. My shopping is now done for the day in under an hour, including a quick lunch on the go: a delicious spinach gozlem (with hot sauce) from the Turkish food kiosk, Eat & Go, and a huge chocolate chip's more cookie from Lovin Eat. So what did I choose for my Dad? It was a difficult decision, but a New West Knife is too useful and beautiful to pass up, and one of the free ties by Andy Fera is a perfect stocking stuffer. What great gifts have you found at The Holiday Shops?